This elegantly proportioned and laid-out apartment lies on the second floor, at the front of the building. 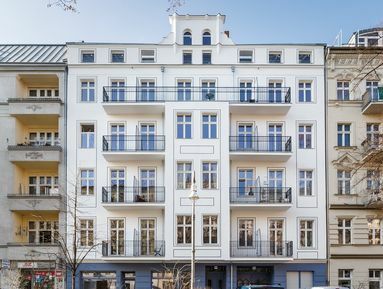 It comprises two large rooms, one with a balcony facing north onto Reichenberger Straße itself, and one with two large windows facing south. The rest of the apartment is made up of the well-proportioned bathroom and kitchen, each with large, south-facing windows. The apartment also enjoys the wooden flooring and high ceilings typical of these Altbau buildings.